6th Annual Mission of Mercy a Big Success! The following piece was written by Kiran Narain, the HealthCorps Navigator serving in CHC’s Mobile Dental Program. She’ll be attending Dental School in the fall! 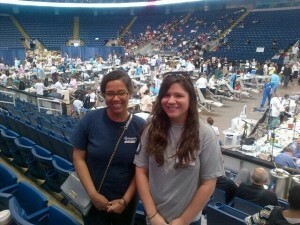 Last weekend, the HealthCorps Navigators volunteered for the 6th annual free dental clinic, Mission of Mercy (CT-MOM). This year, the two-day clinic was hosted in Bridgeport at the Webster Bank Arena on June 7th-8th to serve the underserved and uninsured. 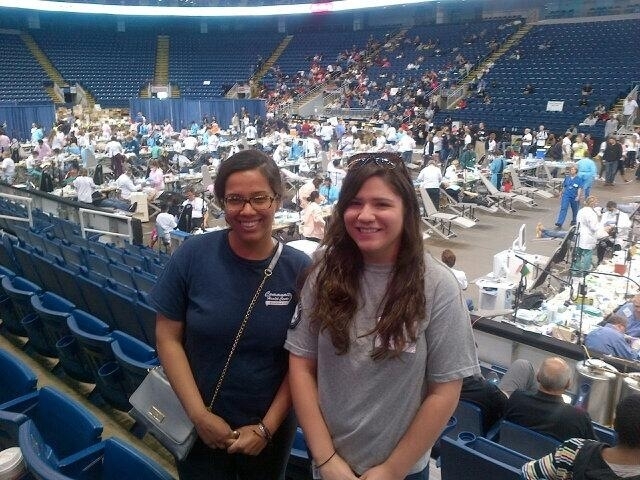 Volunteers began the extensive set-up two days prior to the clinic where the arena was transformed to dental clinic equipped with over 120 dental chairs designed to provide care to approximately 2,000 patients. There was an area designated for medical triage, x-rays, hygiene, restorative, prosthodontics, oral surgery, endodontics and even sterilization. We would have thought that the clinic would be chaotic due the amount of patients seen and number of procedures done however it was very organized. People camped out in the rainy weather for hours and the line formed well before the first patient was seen. One of the patients, Beth, was the first person in line at 2pm the day prior to the clinic opening. That was 19 hours before the clinic began seeing patients! Even with the long wait ahead of her, she was smiling and had a positive demeanor. This sense of positivity and gratitude was felt with everyone who was seen. People traveled from all of the state to receive oral care. On both days, the clinic reached its capacity of approximately 1,000 people by the early afternoon. It was amazing that the clinic was able to offer a wide variety of dental care, from simple to more advanced procedures such as cleanings, restorative, sealants, surgical procedures, root canals, molding and repairs for dentures. One patient told me that he traveled from two hours away to have his one of his bottom teeth reconstructed because it was almost completely gone. This made him hesitant to smile however the expense of dental care prevented him to seek care. Within one hour, he had a brand new tooth and was very grateful for the care that he received. A sense of warmth rushed through me when I felt his gratitude. I recognized that dentistry can raise people’s self-esteem and that a smile is really a work of art. This was my third year volunteering with CT-MOM and has greatly influenced my career path. The disparities and lack of awareness of oral health that I witnessed in my own state at this clinic is why I desired to become a dentist. I developed a passion to serve communities with dentistry during my time volunteering with CT-MOM. In Connecticut, there are approximately 500,000 to 600,000 residents without insurance. Even though, there is now a better understanding of how oral heath affects overall health, dental coverage is not included in many medical insurance plans. Therefore, people have sought out their oral care at clinics like CT-MOM every year, which has become their dental homes. Therefore, I believe that there should be efforts to find the underserved and uninsured a permanent dental home.